Comment: Cultured freshwater pearls are the classic and most widely available type in the market. Naturally, they are also the most widely treated variety. The high costs and hassle of testing them resulted in a pearl-wild-west with 100% undisclosed treatments even if a certain fraction is all-natural and untreated (which fraction it is, remains unknown). Hence, we went through the pain of testing various suppliers' goods and now know who is carrying the real stuff, and who isn't. 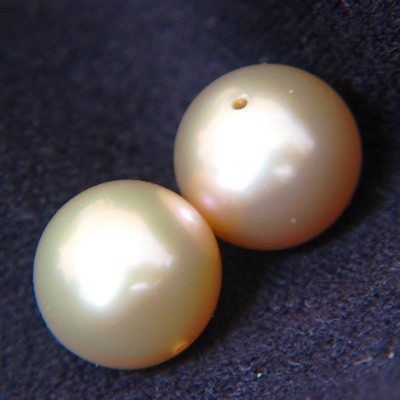 Therefore, we are now in the lucky position to offer you almost unlimited access to guaranteed untreated pearls WITHOUT testing each-and-every pearl in a necklace. Practical, isn't it? 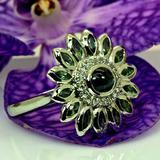 Ask for pricing of sets and necklaces. The here presented padparadscha-colored pair (couldn't resist the beauty of sunset gems) passed the GIA test, as did others from the same supplier (though other sellers' didn't). They are already drilled, shine from a flawless surface (90% is unblemished) with glowing luster, no overtones, only the delicate orange pink. Near round 8mm is a good standard size, but we can now get any size and color in untreated shape. We have a second UNDRILLED pair with GIA report and in the same color. 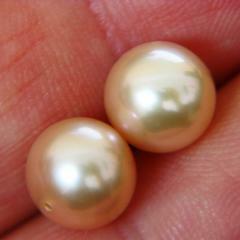 The GIA report states 'untreated cultured freshwater pearls in orange pink'. Contrary to many other products, freshwater pearls can be proud to claim Chinese heritage; the country has been the inventor and world leader in pearls for at least three thousand years. (As with gun powder, silk or paper, China has not always relied on cheaper copies but once was a center of global knowledge). 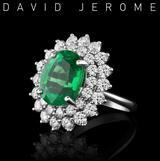 All our gems come with free global shipping, original GIA report, WLT rainforest, grading papers etc.